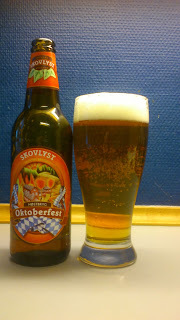 With Oktoberfest on, time for a 'fest bier' or two. Things have really gone downhill for german beer availability recently, well since the closure of Getrænkeland, which sold mostly standard german brews but there was a good few crackers to pick up every now and again. The biggest miss is they had a good selection of oktoberfest bier, so they are sadly missed here. A German inspired festival lager beer, brewed according to the German Reinheitsgebot using only malt, hops, yeast and water. A thirst quenching and fresh beer despite the powerfully malted body and the dark amber golden color. Light aroma of sweet malt from the pour along with caramel and dusty hops. Oktoberfest pours clear amber gold with a frothy white head. Sweet and malty on the intake with caramel and herbs while the finish is dry and mildly hoppy bitter. There is nothing much in the short aftertaste apart from some sweet malt. Medium carbonation, the mouthfeel is light and soft. Well, all the tastes of a oktoberfest are there, but for me it is all a bit of a light edition, more of everything please next year ! Saying that, I still would have no problem drinking a few of these in a small session..if there is none of the real mccoy about, which due to the afore mentioned demise of getrænkeland seems the case this year. I guess I can pack away the cheap pretzels from lidl and borrowed dirndl, I'm joking !...Uhhhmm summing up, quaffable oktoberfest beer light edition. This scored 5/10 on the '5 Bratwurst und 5 bier bitte ' Beerometer. Where to buy CPH : Superbrugsen and other large supermarkets.